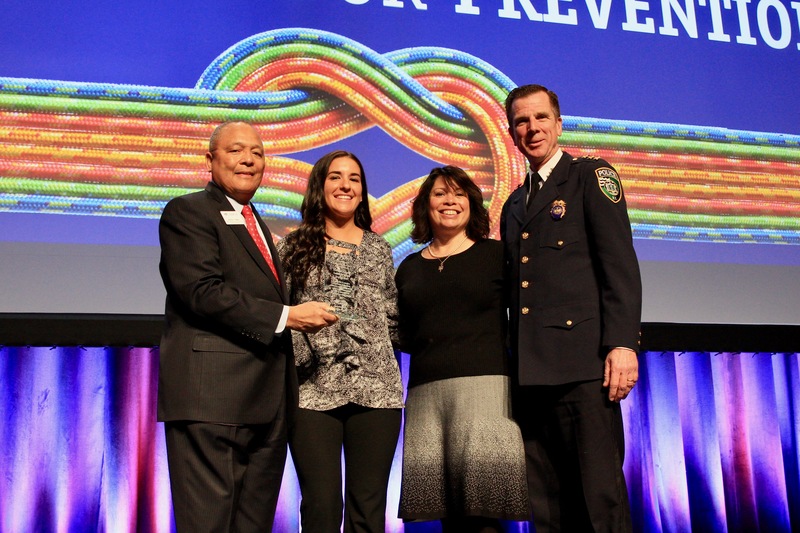 National Harbor, MD – On Thursday, February 8, 2018, Riverhead Community Coalition for Safe and Drug-Free Youth was awarded the Coalition of Excellence Award for Short-Term Outcomes at CADCA’s 28th Annual National Leadership Forum. 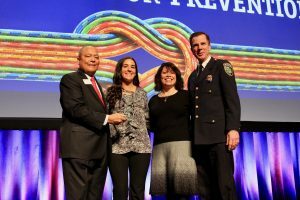 Approximately 3,000 community leaders were in attendance at the event hosted by Community Anti-Drug Coalitions of America (CADCA), the nations leading substance abuse prevention organization. The forum was held Feb. 5-8, 2018, at the Gaylord National Hotel and Convention Center in National Harbor, MD, just outside Washington DC. The Coalition of Excellence award is part of CADCA’s GOT OUTCOMES! award program, which gives national recognition to exemplary coalitions that have clearly documented their impact on population-level substance abuse outcomes. “We congratulate the Riverhead Community Coalition for Safe and Drug-Free Youth on their outstanding work and for being true leaders in the field of substance abuse prevention. Our CADCA GOT OUTCOMES! winners exemplify the excellent work that coalitions are doing around the country to prevent and reduce drug use in their communities,” said Gen. Arthur T. Dean, CADCA’s Chairman and CEO, in November when the awards were first announced. “I am so proud of our adult and youth coalition members and partners for receiving this award,” said Riverhead Police Chief David Hegermiller. “It truly affirms something we already know: that coalitions work. Our coalition is definitely changing, protecting, and improving the lives of our youth.” Chief Hegermiller was on hand to accept the award with Felicia Scocozza and Kelly Miloski of Riverhead Community Awareness Program, Inc. (CAP), who submitted the application on behalf of the coalition. Law enforcement is one of 12 community sectors represented on the coalition, who partnered with Riverhead Police Department, Riverhead Town government, Riverhead Central School District, the Riverhead Youth Coalition, and others, to change local policy regarding retailer compliance checks, festival and fairs where alcohol is served, alcohol use in public spaces, and pre-prom events. To achieve success, coalitions have to determine effective solutions to youth substance abuse in their community. Successful outcomes are typically the result of “environmental strategies,” interventions which change community conditions that contribute to youth substance abuse. In addition to receiving the award, Scocozza and Miloski presented a workshop session about Riverhead Town’s Alcohol Policy entitled, Engaging Stakeholders in Creating and Supporting Comprehensive Alcohol Policies for Public Events, which was attended by over 100 coalition leaders. They also participated on a national panel with the other three Coalition of Excellence Award recipients entitled, Coalitions Achieving Successful Outcomes. 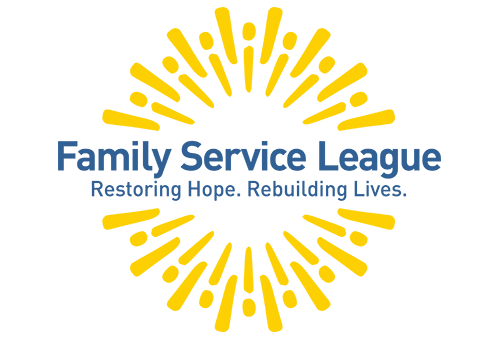 Riverhead Community Coalition for Safe and Drug-Free Youth was founded in 2006 in Riverhead, New York by Riverhead CAP and serves the communities that comprise the Riverhead Central School District. In their application, the Riverhead Community Coalition demonstrated their efforts to address the issue of underage drinking among local students and its root causes of easy access to alcohol and favorable attitudes toward alcohol use among young people. The attached photo shows Kelly Miloski, Coalition Coordinator, Felicia Scocozza, and Chief David Hegermiller with Gen. Arthur T. Dean, CADCA’s Chairman and CEO (far left), receiving the Coalition of Excellence Award at the National Leadership Awards Luncheon on Thursday, February 8, 2018. Advisory to the Riverhead Town Board, CAP is a Community Nonprofit Corporation Supported by the White House Office of National Drug Control Policy (ONDCP), Substance Abuse and Mental Health Services Administration (SAMHSA), NYS Office of Alcoholism and Substance Abuse Services (OASAS), Suffolk County Youth Bureau, and Suffolk County Department of Health Services.